Before I dive in to the review, let me take a moment and congratulate MAKE UP FOR EVER for sending along such an awesome press package, which included a bespoke gym bag, water bottle and yoga mat — all items that are not only amazingly useful, but stuff that I actually really needed right now! 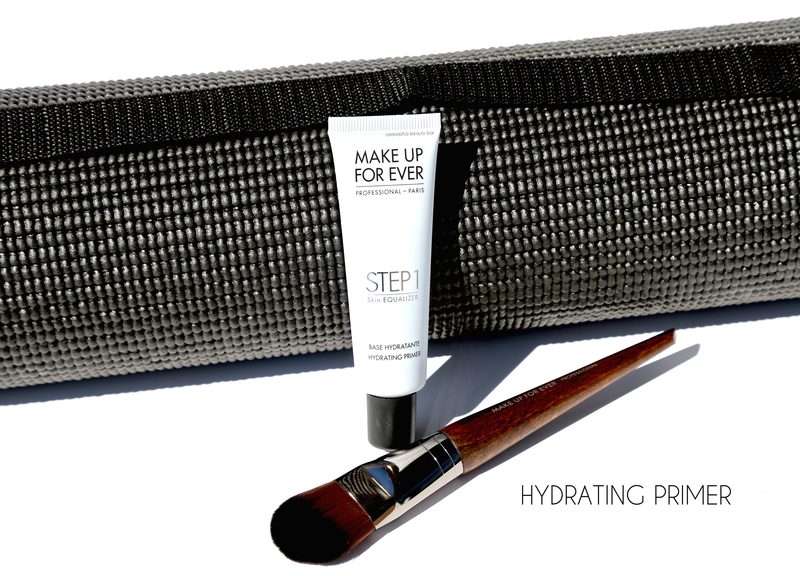 Step 1 Skin Equalizer Hydrating Primer (CAN $45.00) | To go with the 3 colour-matched foundation shades that were sent, MAKE UP FOR EVER also provided this Hydrating Primer (and the brush which follows). Made with hyaluronic acid for continuous hydration, this is the perfect product to use under a mattifying foundation, as it gives skin a dose of much needed moisture coupled with a smoothing base, enabling foundation to be applied easier AND not settle into fine lines. BONUS: odorless and with an undetectable texture once applied. 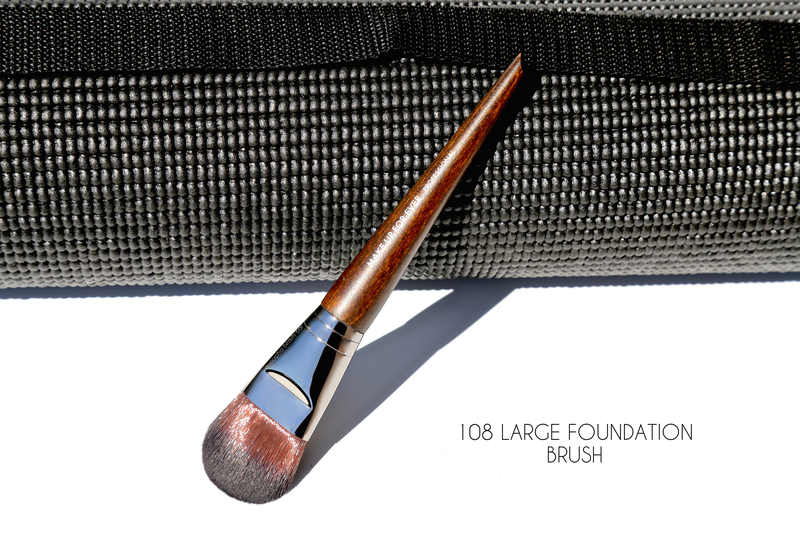 108 Large Foundation Brush (CAN $43.00) | This large, wide rounded brush has been specifically created to help in foundation application, with a shape that’s perfect for reaching large areas of skin quickly and evenly. The fibre bristles do not absorb too much, which translates to less product waste, providing more that can then be worked into the skin. Each MAKE UP FOR EVER Artisan Brush goes through 25 production stages by 30 craftsmen and is checked for quality 50 times before hitting the market; with such attention to detail, the end result is a product that’s well worth investing in. I use a variety of methods for foundation application, from my fingers, a sponge, a flat-topped dense brush, or a paddle-style brush. 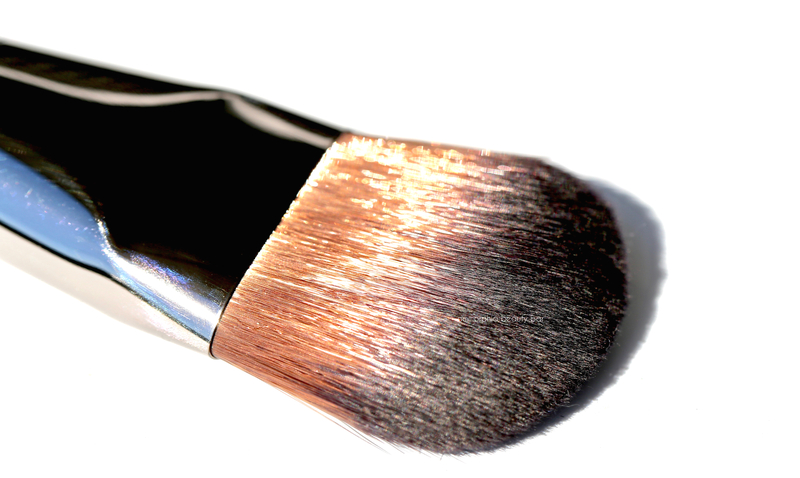 Using a Large Foundation Brush such as this was actually a first for me and apart from how well it worked to buff the product into my skin, I was pleasantly surprised by how easy the process was made. That said, I still prefer using a dampened sponge when working with a matte foundation, as I find it does a better job of leaving the most seamless finish behind, but now I start by using this brush for initial application first, then do all the finishing work with the sponge. Matte Velvet Skin Full Coverage Foundation (CAN $48.00/each) | What this is: a matte finish foundation using next-generation technology for the most comfortable and long-lasting wear. Oil free and available in 40 shades with a range of undertones, it has been created with a unique Flex-Fit Complex that provides the product with the flexibility to move with your skin and thus never caking, fading, or flaking. The texture is a hybrid fluid/cream making it easy to dispense from the nozzle of the flat squeeze tube (no fear of it running) and as it’s highly pigmented, a little definitely goes a long way. The full coverage finish is buildable as well, giving you the option of adding more in areas that need it. I am all about a light coverage foundation and prefer a satin finish, but for special events (i.e. : weddings) I always reach for a matte foundation. That said, I haven’t always had success with the way a matte foundation works with my combination/oily T-zone skin, as it tends to emphasize my lines and winds up looking a bit cakey. When this package came in, I immediately put it to the test under highly rigorous conditions: an insanely hot humid day (trust me, the humidity levels here become EPIC) followed by an intense 3-hour tennis match. The result? My foundation not only stayed in place and did not oxidize, but did an amazing job of keeping excess oils at bay as well. I actually found it looked better by the end of wear, although I did notice some breaking up around the nose — nothing so evident as to warrant being a deal breaker. The best part, in my opinion, is that this texture is incredibly lightweight in feel; I always notice a heaviness with other mattifying foundations, something that was so totally NOT the case here. As I said at the top, MAKE UP FOR EVER is a brand that understands colour and is always on the leading edge of new finishes, textures, and technologies. Originally born out of a need for high-quality products that can withstand the demands of the industry (i.e. 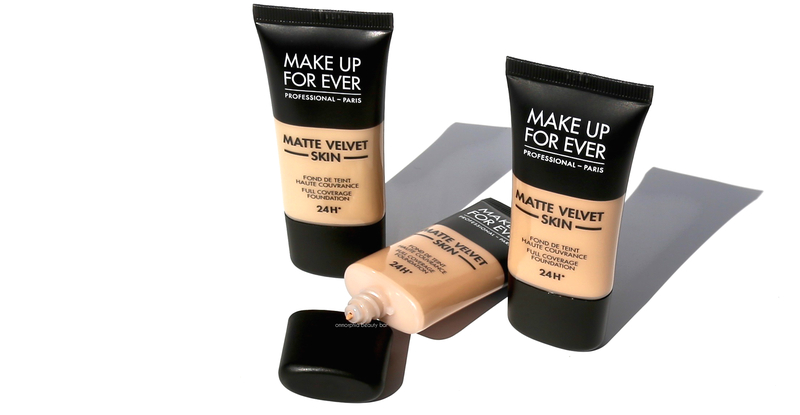 : modelling shoots, fashion shows, theatre), that concept has been refined and distilled for commercial use, as this latest Matte Velvet Skin Foundation proves. The quality and effectiveness is excellent and with the vast colour range available, you’d be hard-pressed to NOT find your exact match. In other words, MAKE UP FOR EVER has your back (and front too, for that matter).